Infiltration is air movement into and out of a greenhouse through cracks and small openings in the shell of the building. New construction greenhouses can range from 0.5 to 1.5 air exchanges per hour while old construction glass glazed greenhouses can range from 1 to 4 air exchanges per hour. Wind velocity has a direct effect on the infiltration rate. 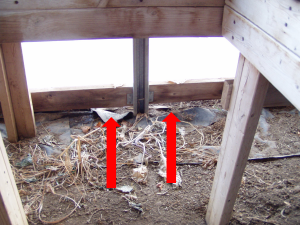 Weather strip, replace gaskets and caulk joints around doors and other opening in the greenhouse shell. Pay particular attention where the greenhouse cover or glazing attaches to the foundation, side walls and end walls and seals around vents. A 1/8 inch wide crack around a 36 inch wide door will allow 500 cubic feet per minute of air to infiltrate and require 25,000 BTU’s per hour of additional heating. Glass greenhouses inherently have more infiltration because of the larger number of joints. 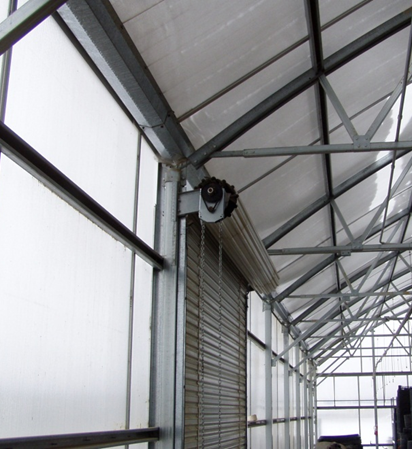 Covering glass greenhouses with a single or double layer of poly film reduces infiltration and heat loss. The cover can be installed permanently or just during the winter months. Reducing infiltration can lead to increased humidity levels and a rapid depletion of carbon dioxide. Mechanical ventilation may be needed to control humidity and can be used to replace the carbon dioxide. If additional carbon dioxide is needed, it can supplied by purchasing compressed carbon dioxide or using a special natural gas or propane burner to enrich the air. The light levels will be reduced by 18% because of the poly films which needs to be taken into accounted in an economic analysis. A double poly cover can reduce heat losses by up to 50%. In open, windy areas, wind breaks in the path of the prevailing winter wind will aid in reducing infiltration losses. A temporary wind break can be made from a 10 to 12 foot high snow fence placed 40-60 feet away from the greenhouse to protect the typical 11-14 foot high greenhouse. A more permanent wind break would be 4 or 5 rows of deciduous and evergreen trees planted 4 to 6 mature tree heights up wind of the greenhouse. A mix of tree species is best to guard against losing the entire windbreak from disease or insects. Hybrid Poplar and white pine can be inter-planted with longer maturing trees to provide a faster wind break. Fertilization and irrigation can accelerate tree growth to provide benefits in about 5 years.